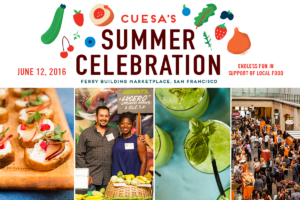 Join us for one of our favorite Sundays of the year at CUESA’s annual Summer Celebration on June 12. barbacco, along with other top restaurants, bars and wineries, will gather at the iconic San Francisco Ferry Building for an evening of unlimited food and drink in support of local food and farmers. The event proceeds provide much-needed support for CUESA’s work to cultivate a healthy food system through farmers markets and education. Purchase tickets to join us!